Back cover blurb: A serial killer to chill your bones A psychopath more frightening than Hannibal Lecter. He has planned well. He leads two lives. In one he's just like anyone else. But in the other he is the caretaker of his family's macabre museum. Now the time has come to add to his collection. He is ready to feed his obsession, and he is on the hunt. Jakey Frith and Clara Foyle have something in common. They have what he needs. What begins is a terrifying cat-and-mouse game between the sinister collector, Jakey's father and Etta Fitzroy, a troubled detective investigating a spate of abductions. Set in London's Blackheath, Rattle by Fiona Cummins explores the seam of darkness that runs through us all; the struggle between light and shadow, redemption and revenge. It is a glimpse into the mind of a sinister psychopath. And it's also a story about not giving up hope when it seems that all hope is already lost. 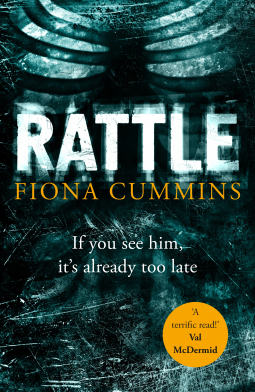 Rattle is the outstanding debut novel by Fiona Cummins. It's only the third book I've read so far due to be published in 2017, but I predict this novel is going to be huge! Rattle focuses on the depraved life of the villain (literally) that they call the Bone Collector, desperately being hunted by Detective Etta Fitzroy. Depicted as a psychopath more frightening than Hannibal Lector, he is truly horrifying. Clara Foyle and Jakey Frith have more than their young age and rare disorders in common. They are both being sought out by the Bone Collector as his next victims. Or as he would prefer, 'additions to his collection'. For the Bone Collector's collection is quite something... but he will not rest until it is complete. For Clara and Jakey, their already challenging life's are about to be turned upside down in away that no one could imagine. Fitzroy must use her already strong instincts about a previous case to lead her to the Bone Collector, and she will not rest until she sees him bought to justice. I don't want to say too much more about Rattle, as it is a novel that you must discover for yourself! Rattle is available from 26 January 2017.